On January 19, 1966 I was a student at Kurnool Medical College, Kurnool. The appointment of Indira Gandhi as Prime Minister delighted my nationalist sentiment. I immediately sent her a letter of congratulations. She graciously responded to the same. During June 1967, I had the opportunity to meet her at her official residence in New Delhi along with a group of college students participating in National Seminar on National Integration. I was granted Short Service Regular Commission in Indian Army Medical Corps in the rank of Second Lieutenant during September 1969 while I was still studying in Kurnool Medical College. My career in Indian Army began and concluded during the years she was Prime Minister of India. Following the death of Indian Prime Minister Lal Bahadur Shastri, Indira Gandhi becomes head of the Congress Party and thus prime minister of India. She was India’s first female head of government and by the time of her assassination in 1984 was one of its most controversial. Gandhi was the daughter of Jawaharlal Nehru, the first prime minister of the independent Republic of India. 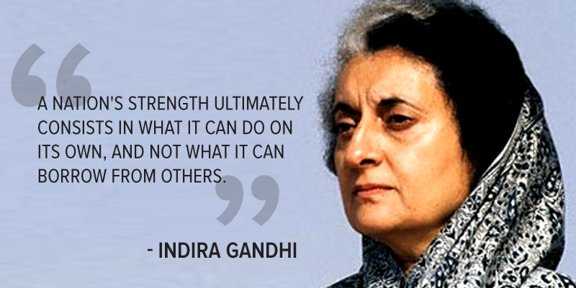 She became a national political figure in 1955, when she was elected to the executive body of the Congress Party. In 1959, she served as president of the party and in 1964 was appointed to an important post in Lal Bahadur Shastri’s ruling government. Soon after becoming prime minister, Gandhi was challenged by the right wing of the Congress Party, and in the 1967 election she won only a narrow victory and thus had to rule with a deputy prime minister. In 1971, she won a resounding reelection victory over the opposition and became the undisputed leader of India. That year, she ordered India’s invasion of Pakistan in support of the creation of Bangladesh, which won her greater popularity and led her New Congress Party to a landslide victory in national elections in 1972. During the next few years, she presided over increasing civil unrest brought on by food shortages, inflation, and regional disputes. Her administration was criticized for its strong-arm tactics in dealing with these problems. Meanwhile, charges by the Socialist Party that she had defrauded the 1971 election led to a national scandal. In 1975, the High Court in Allahabad convicted her of a minor election infraction and banned her from politics for six years. In response, she declared a state of emergency throughout India, imprisoned thousands of political opponents, and restricted personal freedoms in the country. Among several unpopular programs during this period was the forced sterilization of men and women as a means of controlling population growth. In 1977, long-postponed national elections were held, and Gandhi and her party were swept from office. The next year, Gandhi’s supporters broke from the Congress Party and formed the Congress (I) Party, with the “I” standing for “Indira.” Later in 1978, she was briefly imprisoned for official corruption. Soon after the ruling Janata Party fell apart, the Congress (I) Party, with Indira as its head, won a spectacular election victory in 1980, and Gandhi was again prime minister. In the early 1980s, several regional states intensified their call for greater autonomy from New Delhi, and the Sikh secessionist movement in Punjab resorted to violence and terrorism. In 1984, the Sikh leaders set up base in their sacred Golden Temple in Amritsar. Gandhi responded by sending the Indian army in, and hundreds of Sikhs were killed in the government assault. In retaliation, Sikh members of Gandhi’s own bodyguard gunned her down on the grounds of her home on October 31, 1984. 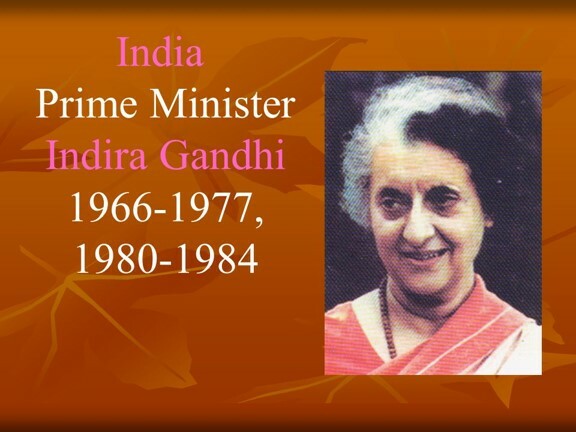 She was succeeded by her son, Rajiv Gandhi.